← The “Arab Spring” – What’s Really Blooming? A front page story in last Saturday’s The Plain Dealer read, “Black Friday brings ‘riot’ in Strongsville, pepper spray in LA.” Now there’s a great way to begin the Christmas season — consumers gone wild! As appalling as it is for a mob of shoppers to squabble over limited quantities of hot-ticket items and knock people down to get to them first, I don’t totally fault the shoppers. I know, they are the ones who toppled the floor displays. They’re the ones who threw around slippers and underwear in what was described as a “free-for-all” in the mall’s Victoria’s Secret store. It’s true that nobody made the lady use pepper spray against other shoppers in the video game aisle of a Los Angeles Walmart. She did it all on her own. But what about all the pre-Thanksgiving hype about “door buster” deals enticing shoppers to camp out days in advance at the stores? What about the merchants who couldn’t wait until Friday morning but just had to open their doors before Thanksgiving dinner had settled so they could start raking in the dough? I don’t feel sorry for merchants who have shopper problems when their advertising gimmicks invite mayhem. Maybe it’s just me, but I think the whole deal is getting more ridiculous each year. I wonder if there is any hope of rescuing it. 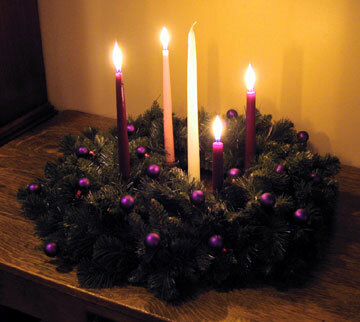 Yesterday was the first Sunday of Advent, the season on the Christian calendar stretching from the fourth Sunday before Christmas to Christmas Eve. It is intended to be a season of preparation for Christmas. This preparation is not about Christmas shopping, cookie baking, or gift-giving. Advent is about spiritual preparation. The word “Advent” comes from the Latin word adventus which means “coming, arrival” or “visit.” Its focus is on celebrating the birth of Jesus in His first coming. It recalls the Old Testament prophecies foretelling the Messiah’s coming and reminds us that the reason for His coming was redemptive. But Advent does not stop at the manger. It looks ahead to another coming, a second advent of Jesus. Advent isn’t just about the Christ-Child born into humble surroundings in Bethlehem. It is equally about the Conquering King returning in glory for a second visit to Earth. Just as Israel was called to prepare for His coming through repentance, so we today are called to prepare for His return. It is the remembrance of His first Advent and the anticipation of His second that fills this season with expectation and hope. It calls us to celebrate Christ, to be satisfied with Him, and to long for His return. I remember as a child counting down the days until Christmas, the excitement of Christmas Eve and the eager anticipation of the next morning. That is the eagerness Advent impresses upon us for the return of our Savior. The hope inspired by this season does not reside in the goodwill among men seen in their cheery dispositions or their “niceness” to others (though that seems a rarer commodity in the shopping centers these days). The hope of this season is Christ. Though I didn’t grow up observing Advent, I see value in expanding the celebration of Christmas Day into a whole season, but not the way we do it now with our shopping, cookie-baking, Christmas movies, parties, programs, and tradition-keeping. Rather, its real value will be discovered by making it a season of spiritual reflection, true heart repentance, and a time for hoping in, loving, and above all treasuring our Savior. The colors symbolic of the Advent season are not red, green, silver and gold. They are purple (or dark blue) and pink. The purple symbolizes the seriousness of the season, the need for repentance, and the sovereign royalty of the One Whose arrival we celebrate. Compared to purple, pink is a lighter shade, a minor color that symbolically points to the joy associated with the season. It reminds us that the true joy of this season is not in the family traditions or festive celebrations. It is a deeper joy that is connected to the seriousness of our need, and that in our neediness God is with us! It is a joy that flows out of not being abandoned by God, but being forgiven and reconciled to Him. That is the joy of this season. That we settle for lesser joys is why December 26 is such a let-down. You may not be an Advent observer. It seems to me like we could use a little more of it these days, especially among Christians, lest we find ourselves caught up with the pushing and shoving shoppers who seem to find their greatest joys in the phenomenal deals they get. Nothing, and I say it again, nothing tops the deal we got when Jesus came. And nothing tops what’s in store for us when He comes again! Nail that one down and those hot-ticket items that rev up shoppers will look like nothing but cheap tricks. This entry was posted in Uncategorized and tagged Advent, Christian Living, Christianity, Christmas, Consumerism, Return of Christ. Bookmark the permalink.